The month of August has arrived. August is the last month of the 2017-2018 Legislative Session. Accordingly, I will be voting on what seems to be an easy one-thousand bills between Monday and August 31st. Consequently, you may see me referenced in articles like The Sacramento Bee piece below when I break from the customary herd and vote for certain bills. Two thoughts. The first is that I did sneak in some family time during the summer break. My father and mother have not had the chance to visit me while in Sacramento. So, my wife and I drove them up and nearly gave them the full tour. The lights were being replaced, so with massive scaffolding where our desks usually are, I couldn’t bring them onto the Senate Floor. The second thought is the bill discussed below. The author, Sen. Nancy Skinner, visited with me and explained her bill and requested my vote. I asked her a number of questions about my concerns and she responded to each one with my satisfaction. Serving many years in prison or jail for being with certain individuals at the wrong place and time is not necessarily a fair stiff-sentencing opportunity. It is certainly a reminder that we must teach our children to pick their friends properly. But, suffering for the illegal actions committed by someone else deserves another look. That is why I voted for SB 1437. Neko Wilson says he got cold feet that day nine years ago. He was 27, and had originally gone to Kerman, a city in Fresno County, to case a marijuana grow house with a few other people. He says he backed out when his partners decided to rob the house and circled the block instead, trying and failing to contact the group. Later, he found out that one man in the group killed the couple in the house. Court documents say Wilson had not entered the house or even left his car. But two weeks later, officers from the Fresno County Sheriff’s Office arrested him and charged him with two counts of murder. The officers used the felony murder rule, a California law that says people can be held criminally liable for murder if a death occurs during a felony, like a burglary or robbery, even if the person wasn’t present. Now California lawmakers appear poised to change the decades-old law, and Wilson, who has spent nine years in Fresno County Jail awaiting trial, may soon have the chance to walk free. Skinner said that the felony murder doctrine disproportionately affects vulnerable groups. A recent survey of 1,000 prisoners conducted by the bill’s supporters concluded that the felony murder rule disproportionately affected women and young people. Of the women convicted of first degree murder under the felony murder rule, 72 percent were not the perpetrators of the homicide, according to the survey. Skinner’s proposed change would be retroactive, allowing those imprisoned to seek new hearings by proving their actions did not fall into the new definition of the law. Prosecutors would have to prove otherwise, or allow re-sentencing. Supporters estimate that between 400 and 800 people are serving sentences for felony murder and could apply for re-sentencing. The bill, which is pending in the Assembly, easily gained the support from majority Democrats in the Senate. Two conservative Republican senators, Joel Anderson of San Diego and John Moorlach of Costa Mesa, also voted for it. Anderson says the bill merely assigns blame to the correct people. Murderers and shoplifters committed different crimes and therefore should be punished differently, he said. “This bill sets out to separate the two, to give real justice to those who weren’t active participants in the murder of another,” Sen. Anderson said on the Senate floor. The bill still faces intense opposition from prosecutors and police organizations, who say it allows people who have committed crimes leading to a death to potentially go free without accepting responsibility for the death. Victim advocacy groups also argued that the bill’s language was too broad, providing no difference in treatment between violent felonies and nonviolent felonies. Nina Salarno, the president of Crime Victims United, said that although the group supports some changes, the bill went too far to reduce sentencing for felons. A legislative analysis estimated it could cost millions for the courts to process the re-sentencing requests, but also stated that shorter sentences could save millions annually. According to state budget estimates, each state prisoner will cost taxpayers more than $80,000 this year. Prosecutors have noted that many people are serving time under the law because of plea bargains, which will leave few or no court records to reference during the re-sentencing process. Jacque Wilson, Neko Wilson’s brother and a public defender in San Francisco, said that the bill is Neko Wilson’s chance to reunite with his family. Monday was mixed. SB 1363 passed unanimously on the Senate Floor. SB 1074 was killed in the Senate Business, Professions and Economic Development Committee on the basis that the price for a gallon is the price for a gallon of gas and the details be damned. And SB 1031, 1032 and SB 1433 were killed in the Senate Public Employment and Retirement Committee, with SB 1033 held back for more consultation with the Committee Chair and CalPERS. The Sacramento Bee covers it in the first piece below. It also discusses SB 1149, of which I was a proud Co-Author. SB 1159 went out of Senate Appropriations successfully (see MOORLACH UPDATE — Right to Peaceably Assemble — April 13, 2018). The new Editor for CalMatters, Dan Morain, has some fun with it in the second piece below. Dan was formally with the LA Times and recently resigned from the Sacramento Bee. We go pretty far back. Dan’s piece brings up an interesting concern. As a C.P.A., am I prohibited from doing something that will encourage more C.P.A.s to run for legislative office? Is it really self-serving? Would any other legislator be able to carry such a bill? All retired C.P.A.s are required to note that they are “retired” or “inactive” on their stationery. But, attorneys in the Legislature are exempted from the requirement to obtain continuing professional education. Other professional licenses do not require qualifiers. I know that retired military officers do it. If you’ve earned an MBA, you can keep it behind your name for the remainder of your life. Accordingly, I worked for the last couple of years with the California State Board of Accountancy for a reasonable solution. They recommended that instead of doing something administratively, that I introduce a bill. The Board supported the language we proposed for SB 1159. I did have a potential author, a former staffer for Congressman Brad Sherman, but he resigned from the Assembly recently. Consequently, I decided to move forward and let the cards fall where they may. For entertainment value, the most recent edition of Inside OC finds host Rick Reiff rattling my cage on a number of current issues. It’s the third link below. Though the Legislature has often doled out tax credits to preferred industries, such as Hollywood and “green-energy” companies, Mr. Moorlach finds such favoritism distasteful. “I’m not an advocate of special incentives,” he said. Three years later and I’m still of the same mind. I would prefer to deposit $330 million in one of California’s pension plans or other post employment benefits to reduce the unfunded liabilities. And why give a tax credit to one industry when so many others are trying to make do? Why not a “no better, no worse” approach? And, worse, while the Capitol is trying to improve the culture, why give tax credits to an industry that brought us Weinstein and Toback? The Los Angeles Business Journal mentions the fun on this topic in the fourth piece below. Last week, Wednesday, I had one of the more awkward moments while presenting a bill. SB 1325 used an existing “Act” title. Rather than debate the actual policy in my bill, one of my Senate colleagues made it personal and proceeded to impugn my intentions where he actually presumed that I was being a racist toward an Asian Pacific Islander Caucus member, a charge that not only caught me off guard, but was highly inappropriate and regrettable. I met with both of them the following morning to dispose them of any untoward motives. Ironically, a few minutes after these two discussions, my grandson, Koa, was born. Koa would qualify as a member of the Asian Pacific Islander Caucus. The presentation is addressed by Vactruth.com in the last piece below. Future state workers, your pension cost-of-living adjustments are safe, and you won’t get to choose between a CalPERS pension and a 401(k) plan anytime soon. Both proposals were shot down on Monday by a Senate committee that rejected a pack of bills aimed at reducing the risk taxpayers face if an economic crisis cripples the state’s public pension funds. Most of the bills came from Republican Sen. John Moorlach of Costa Mesa and Democratic Sen. Steve Glazer of Orinda, who argue that the rising cost of public pensions could drive local governments into bankruptcy when the next recession hits. “We need to right-size the system. We need to restore public trust, because we’re going off a fiscal cliff,” said Glazer, the former Orinda mayor who sponsored the bill that would have allowed state workers to choose to participate in defined contribution 401(k) plan instead of the defined benefit plan offered by the California Public Employees’ Retirement System. ▪ Moorlach’s Senate Bill 1032, which would make it easier for local governments to separate from CalPERS without paying the hefty termination fees that CalPERS charges to fund pension obligations for defunct agencies. If an agency quits CalPERS without paying the fees, CalPERS slashes the pensions it provides to the agency’s former workers. ▪ Moorlach’s SB 1031, which would prohibit pension funds from providing cost-of-living adjustments to retirees if the pension fund has less than 80 percent of the assets it would need to pay the benefits it owes. Most retired public employees can receive cost-of-living adjustments of 2 percent each year, but some contracts allow up to 5 percent. Moorlach’s proposal would have applied only to state workers hired after Jan. 1, 2019. Ted Toppin, a lobbyist for state scientists and engineers, called the bill to waive CalPERS’ termination fees an opportunity for employers to “stiff” their workers in retirement. Calling politicians self-serving can be redundant. It can be bipartisan, too. Sen. John Moorlach, an Orange County Republican, and Congressman Brad Sherman, a San Fernando Valley Democrat, are certified public accountants. Because they haven’t kept up with their continuing education requirements, their licenses are inactive. No big deal. Lots of professionals let their licenses lapse. So what? In 2009, the Legislature, without a single no vote, approved a measure that says all inactive CPAs must disclose their status on any business communications in which they call themselves CPAs. That includes Moorlach and Sherman. A rich target: The Senate Appropriations Committee approved Moorlach’s bill unanimously on Monday. At an earlier hearing, Moorlach seemed somewhat sheepish, calling the bill “a little self-serving.” Sen. Bill Dodd, a Napa Valley Democrat, voted no at that hearing, and made a point that accountants would appreciate: pushing a single bill through the legislative process costs about $10,000. Los Angeles — A bill to extend California’s motion picture tax credit program sailed through Assembly and Senate committees last week. “Clearly we have a lot of work to do – I think there is much more we should do,” said Kansen Chu, a San Jose-based Democrat and chair of the Arts, Entertainment, Sports, Tourism and Internet Media committee. Chu and four other members of the committee all voted on April 18 to approve Assembly Bill 1734, which would lengthen by five years California’s $330-million-a-year film and television tax credit program. The policy is due to sunset at the end of 2019. Committee members also approved without opposition Assembly Bill 2936, a similar measure to continue the credits. The California Senate Government and Finance Committee, meanwhile, passed its own tax credit legislation, Senate Bill 951, on April 19 by a 5-1 vote. Chu expressed concerns the tax credits aren’t doing enough to diversify Hollywood. Assembly Majority Leader Ian Calderon, a Democrat from eastern L.A. County and sponsor of AB 1734, has said that a final version of the bill could include greater incentives for women and minority filmmakers. The California legislature passed in 2014 an expansion of the state’s tax credit program for movies and television shows from $100 million a year in credits to $330 million per annum. The legislation provides television shows relocating to the Golden State and movies that shoot in California with a refund of 20 percent to 25 percent on crew member wages, as well as production and editing costs. The policy applies statewide but has an outsized effect in Los Angeles County, which hosts more than 90 percent of shoots that use the credits. California differs from other states, such as Georgia and Louisiana, by limiting its credit programs to film crew, without reimbursement for the wages of actors, writers and directors. The California Chamber of Commerce and various labor unions attended the committee hearing to shower praise on tax credits, stating that they generated billions of dollars in spending including crew wages. The lone dissenting vote came from Sen. John Moorlach, a Costa Mesa Republican. De León’s Senate Bill 1206 would put the $2-billion loan on the ballot in November, freeing up the money if voters approve the measure. De León said had he been able to predict the 2016 plan would end up in court, he would have sought a ballot measure at the time. De León noted that the 2016 plan had bipartisan supermajority support in the Legislature, something his new bill also will need to get on the ballot. Sen. John Moorlach (R-Costa Mesa) is a coauthor of the plan. SB 1206 is scheduled for its first hearing in the Legislature on Wednesday. Should De León’s measure be approved, it will join a crowded list of housing issues before voters in November. Californians will decide on a separate $4-billion bond to help finance new low-income housing and home loans for veterans. De León said he’s not worried those two measures will compete against each other because voters are aware of the scale of the state’s housing problems and the proposed homeless housing bond redirects existing dollars instead of raising taxes. “Once [voters] know that the impact on their pocketbook is not existent, I’m confident that they’ll join me and my colleague John Moorlach in support of this measure,” De León said. PANDA was written and named by Glaser before virtually everyone (including Glaser) had ever heard of Senator Pan. This is because the PANDA bill was written 1-year before Senator Pan gained notoriety by introducing California’s mandatory vaccination law SB 277. Recall that Senator Pan capitalized on the 2014 Disneyland measles event to push SB 277 through the California legislature, even though not a single child was injured by those measles, or even by most measles – see here; and further, the measles-containing vaccine has not been scientifically proven to be safer than the measles – see here. We spoke with Glaser to confirm these details. And indeed, Glaser helped us confirm the obvious: his bill “PANDA” was named before Pan’s SB 277 and it was a reference to the word “pandemic” because it came through the Pandemic Response Project. From the video recording, Senator Moorlach was obviously stunned and speechless at Senator Newman’s allegation. Senator Moorlach said he did not know what to say, because he had never drawn the same pneumonic association that Newman was suggesting was racial. The video also shows the Democratic chair of the Committee refused to let Glaser even speak a word to explain the bill’s name origin (naturally, Glaser would have explained that PANDA was a reference to “pandemic” because it came through the Pandemic Response Project, long before SB 277). It is currently unknown whether the chair of the committee was also collaborating with Newman to intentionally fabricate a racism allegation, especially because he was also involved in the pre-event whispers with Senator Pan. Instead, Senator Pan conducted a unilateral dialogue with a single opposition witness regarding cherry-picked measles cases. Senator Pan did not question the expert witness in support of PANDA, Tina Kimmel, PhD, MPH, who worked for the California Department of Public Health for most of her career, including within the Immunization Branch. Dr. Kimmel provided testimony that emphasized why mandating vaccination has been proven to be counterproductive to public health goals. Indeed, none of the Senators asked Dr. Kimmel any questions. So on multiple levels, it does not appear that PANDA was given a fair or honest hearing. Let’s consider why this bill – PANDA – is much more effective than mass coercive vaccination in the event of a public health emergency. Even if we ignore the studies and surveys that show unvaccinated people are statistically healthier than vaccinated people, we cannot ignore the large, time-tested and statistically validated fact that isolation, sanitization and self-quarantine is far and away the most effective method whereby infectious disease transmission is obviated. Note for example the figure below: it compares smallpox fatality rates in virtually unvaccinated and “unprotected” Leicester versus vaccinated/revaccinated populations in various areas (Japan, London, etc.). What does one see? The smallpox fatality rates are significantly lower in unvaccinated Leicester – a region which utilized the self-quarantine method to preclude infectious disease transmission. The facts ostensibly demonstrate that mass coercive vaccination is not the most effective method (in fact, evidence indicates it worsens mortality). Beyond the scientific aspect, coercive vaccination (in public health emergencies) that abrogates civil liberties, constitutional rights, and bioethical principles internationally regarded (bodily autonomy, inviolability, self-determination, etc.) acts to foster distrust of governmental authorities, and actually elicits greater rebellion and associated chaos. These legal concerns from the ACLU and CDC were the primary point that Glaser emphasized during the hearing, while his fellow witness, Dr. Kimmel, focused her testimony on the public health benefits of PANDA. So, what could possibly be the impetus for opposition to this logical, scientifically/statistically proven method, which sensibly balances public health with respect for civil liberties? Did Big Pharma strike again? “When Senator Newman challenged the name PANDA as derogatory, I was shocked. I know Senator Moorlach was shocked too. He was just standing there and didn’t know what to say. Obviously racism isn’t something our offices had ever talked about or even considered. The Committee chair wouldn’t even let me speak to explain the bill’s origins from the word “pandemic”. I found it strange that a surprise, fabricated side-issue could actually derail a very serious civil rights bill. I’m not a political guy, so I didn’t really understand what was happening in that Senate room. All I know is what I saw. The Senators asked no questions about the ACLU or CDC references that we provided. Perhaps that’s just how these hearings go, but it didn’t seem like an honest hearing to me. From my experience in courtrooms, I can only say that ignoring actual evidence in favor of an unsubstantiated sideshow would never happen in an honest courtroom. I also observed several other bills on calendar at this Health Committee, and there was an obvious pattern – this Health Committee has taken up the banner of financing the public’s demand for drugs and surgery. Let’s just deal with Caltrans and its mismanagement. Think high speed rail (although it is not responsible for this agency, it can’t brag that it’s doing better). Therefore, think budget overruns. Think a $6 billion-plus Bay Bridge, which was supposed to cost $1 billion. Think 3,500 architects and engineers too many. Think only 20 cents of every dollar actually going to road repairs. Think a Department Head golfing on your dime. Think an engineer who golfed 56 days without management raising a stink. Think spending $250,000 for software at the height of the recession and then not using it, but falsely telling the Legislature that it was being used. Think road repairs running more than four times the national average; and we don’t have long winter snows on our highways. I could go on. In fact, I already did in previous UPDATEs. If you need the links, I can provide them. But, it would double the size of this e-mail. So let me give you just one. Think public employee union controlled department (see MOORLACH UPDATE — Blame the Unions — November 9, 2015). The previous Director for Caltrans, one whom I found totally tone deaf, recently left and was replaced by an insider by the Governor. I am doubtful that a career long bureaucrat is going to turn this agency around. Today, I reintroduce the idea of outsourcing (for a sample, see MOORLACH UPDATE — Transportation Strategies — August 13, 2015). The Sacramento Bee starts the new spree of mismanagement in the piece below, which is front page, top-of-the-fold, allowing me to be one of the dissenting voices. It is such a shame that Caltrans is such a bureaucratic mess and that it was not reorganized first. What’s worse, is that the state could easily accommodate more contractors and not have to hire a single, permanent union employee who will immediately increase California’s unfunded pension liabilities that are already massive. If California’s Department of Transportation was one of the best in the nation, then I could, in good conscience, support more road funding. Orange County did it with Measure M. Twice! 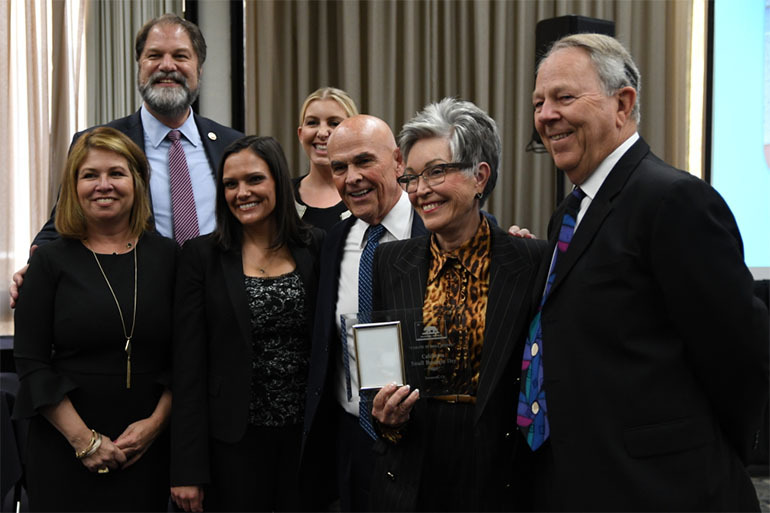 During her illustrious career, both as a music teacher and a philanthropist, Ruth Ding has inspired students and members of her community with her organizational expertise and unflagging optimism in all her endeavors. She credits the strong work ethic and vision that her family instilled in her throughout her upbringing for her positive outlook on life, which served as a constant reminder to never take for granted the opportunities that she was afforded. Ms. Ding received her Bachelor of Arts degree in Music from Arizona State University. Her graduate work was performed at the University of Southern California. She has been an activist and promoter of the arts and Chinese culture in Orange County for over 50 years. She was honored in an article by Jodi Cadenhead of Newport 17 Magazine that celebrated “Champions of the Arts.” She has produced and chaired many ethnic festivals, music, and cultural programs in Southern California. In addition to her commitments to the arts, Ms. Ding is extremely active in a number of philanthropic community interests. She is the founding president of the Orange County Chinese Cultural Club and Pan Pacific Performing Arts, Inc. She served on the founding board of the Opera Pacific and Asian American Senior Citizens Service Center in Santa Ana, and the Segerstrom Center for the Arts in Costa Mesa. She was also the 2011 Gala Chair for Founder Plus, a support group consisting of founders of the center. These initiatives support education and community programs. Ms. Ding believes deeply in not only supporting the arts but also in instilling pride in younger members of the Chinese American community. Ms. Ding was also instrumental in founding several major benefit events including the Opera Pacific Opera Ball, the Asian Headdress Ball, The International Music and Dance Festival, the Winter Blossom Ball and AASCSC’s “Winter Gala” which raised $200,000 for vital programs hosted by the Senior Service Center. Ms. Ding has been honored with numerous leadership, music and service awards in her illustrious career. She has received the “Special Commendation for Service to Orange County Award,” presented by the Orange County Board of Supervisors, and she was also made an “Honorary Goodwill Ambassador” by former Secretary of State of California, March Fong Eu in 1990. 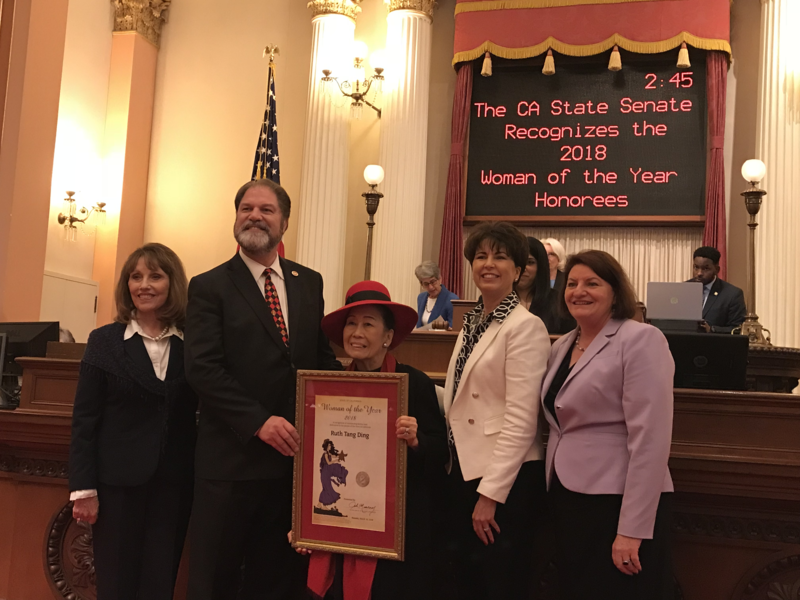 She is also listed in the “International Who’s Who of Women”, The Dictionary of International Biography, and now the California State Senate Woman of the Year. No kidding: It’s a really good time to send a résumé to Caltrans. California’s transportation department plans to swell its staff by 10 percent over the next five years, adding 2,000 employees to help it execute projects funded by the new gasoline tax. Those positions run the gamut from maintenance to architects and engineers. It has so many jobs on such a tight time line that the department is trying to cut through some of the state civil service rules that govern who it can promote. Last week, it tried to wipe out a promotion list for senior engineers that was made up exclusively of internal candidates so it could more quickly hire from a different promotion list that included candidates from outside the organization. In its request to the State Personnel Board, the department said that it will have a challenging time making a case to expand its headcount if it’s too slow filling its current vacancies. “To justify these additional position resources it is essential that all departmental resources are filled,” the state Human Resources Department wrote on behalf of Caltrans. Caltrans didn’t get everything it wanted. It struck a deal with the Professional Engineers in California Government – the union that represents transportation engineers – that would let the department promote from both sources without throwing away the roster of eligible internal candidates. The union, the department and the members of the State Personnel Board all stressed that Caltrans has to move fast to take advantage of Senate Bill 1, the law that hikes gas taxes over a decade to fund transportation projects. “The governor’s directive to get SB 1 dollars out is imperative. We don’t want to disadvantage the department,” State Personnel Board member Richard Costigan said. Caltrans began escalating its hiring efforts a year ago, first to replace retiring workers and then to prepare for the gas tax funding. The tax and other fees will deliver about $5.2 billion a year for transportation over the next decade. “SB 1 is an all-hands-on-deck moment,” said Ted Toppin, a lobbyist who represents PECG. California Republican leaders and the Howard Jarvis Taxpayers Association are campaigning to repeal the gas tax, although their efforts have not yet qualified to reach voters as an initiative. Sen. John Moorlach, R-Costa Mesa, thinks Caltrans is getting ahead of itself with its hiring spree. He wrote a bill three years ago that would have compelled the department to hire more private sector contractors rather than public employees. The construction industry and labor unions last week released a study that argued the new gas tax would have wide-ranging benefits over the next decade, supporting about 68,200 jobs each year. The study by the American Road and Transportation Builders Association said about 14,000 jobs would be in transportation and warehousing, 7,500 in services, 4,300 in retail, and 3,900 in real estate and housing. To get started on a Caltrans application and learn about the state’s hiring process, go to www.jobs.ca.gov.